The discipline areas to which the IMB is relevant include Classics, English Language and Literature, History and Archaeology, Theology and Philosophy, Medieval European Languages and Literatures, Arabic and Islamic Studies, History of Education, Art History, Music, eatre and Performance Arts, Rhetoric and Communication Studies. The International Medieval Bibliography comprises 440,000 articles, all of which are fully classified by date, subject and location, and provide full bibliographical records. The IMB offers an unparalleled tool for medievalists to identify the contents of current work published throughout Europe, the Americas and the Asia-Pacific region. The discipline areas to which the IMB is relevant include Classics, English Language and Literature, History and Archaeology, Theology and Philosophy, Medieval European Languages and Literatures, Arabic and Islamic Studies, History of Education, Art History, Music, Theatre and Performance Arts, Rhetoric and Communication Studies. 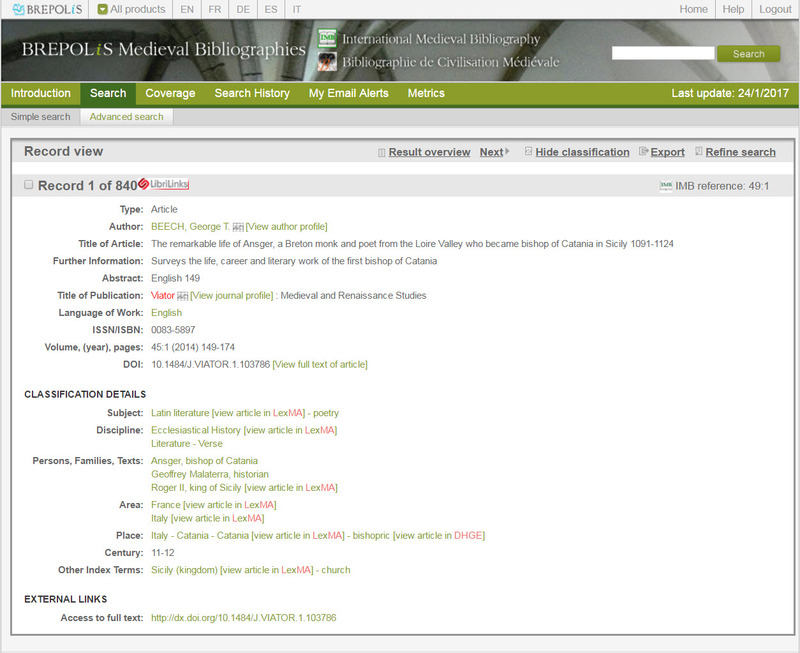 A comprehensive cataloguing and indexing system, using familiar, multilingual terminology designed by professional medievalists for medievalists. The IMB is the fruit of a partnership between the Institute for Medieval Studies (University of Leeds) and Brepols Publishers. See also the Bibliographie de civilisation médiévale, the International Bibliography of Humanism and the Renaissance, the Lexikon des Mittelalters. The list of covered journals is available here.